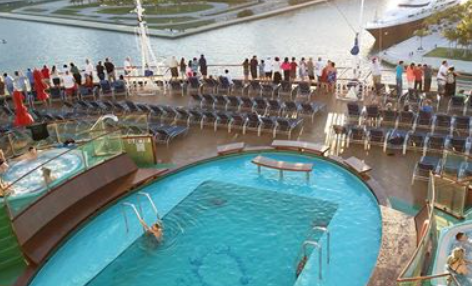 This cruise was one we had been planning for over a year. 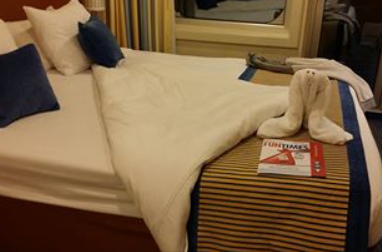 We booked it when we were on board the Triumph in October 2013, which was Tom’s first cruise. 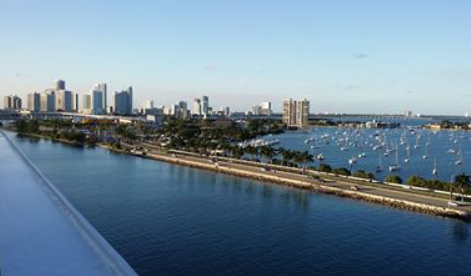 We wanted to sail the Breeze because it was Carnival’s flag ship, and we wanted to sail out of Miami so we could visit some of the eastern Caribbean islands that aren’t included on any of the Galveston itineraries. From the beginning, it was to be our 20th anniversary wedding celebration, and somewhere along the way we decided to go all out and do a formal vows renewal ceremony. I set that up with Carnival a few months prior to the cruise, which was surprisingly easy. 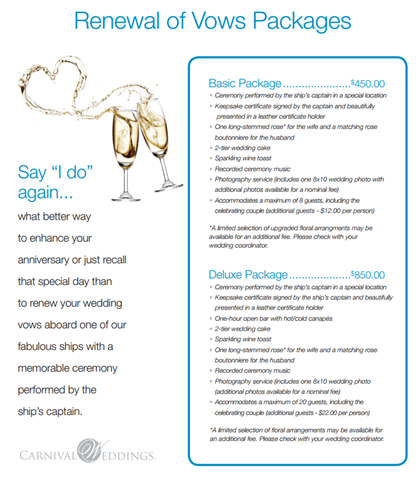 We selected the more modest basic package that allows for six guests (in addition to the couple) and includes cake, champagne, one 8×10 photo and a nice certificate signed by the captain, who officiates. $450 seemed like a pretty reasonable price. We hoped that some of our friends from work or the neighborhood or my cousins might be able to join us on that cruise, but that didn’t work out. However, I had made a number of online friends through the Facebook group that I set up for our sail date, and invited some of them. On December 5, the day before the cruise, we were scheduled to fly to Miami and spend the night in a hotel. We’ve flown in the morning of a cruise twice before with no problems, but didn’t want to risk it in winter weather. Our journey started out with a major stress event. My son, who was house-sitting and dog-sitting for us, went with us to the airport so he could drive our car back. On the way, I checked my mail on the phone. There was a balance alert that a credit card I use only for a few small things has a balance of over $5000. WTF? So I get out my Surface Pro, connect to the phone’s 4G signal and check the credit card web site (no, I don’t do financial stuff on the phone – I just don’t). Sure enough, it showed dozens of charges to United Airlines. Which I don’t fly; I’m an AA girl. On the way to catch an AA flight at that moment. Oh, the irony. Okay, this was just what I needed, right? I was already worried about having a connecting flight, about Kniki getting to Miami on time, about all the plans for the “wedding” so what’s a little more stress? I called the bank that issued the card and I have to say the guy there was great. Soothed my panic as if he’d done that a thousand times (and he probably had). By the time we got to the airport, he had it all fixed and arranged to overnight a new card to the house, where Kris would be there to sign for it. Whew. Disaster number one was averted. The traffic was horrible but we had left early so we got here on time. Thanks to global entry/Pre-check, we sailed through security with no problems and thanks to my card, we settled into the Admiral’s Club at DFW to wait for our flight (told you I’m an AA loyalist). Since we were in first class (thank you, frequent flyer miles), there was plenty of room to spread out and enjoy the breakfast service. The plane was equipped with wi-fi so I was able to keep my Facebook friends updated on our progress and even get a little work done. We landed smoothly at Orlando, and that’s where our luck turned again. First, there was no Admiral’s Club there, so we were stuck on very uncomfortable seats at a busy, noisy gate for almost two hours. We thought. It ended up being a lot longer, as our flight was delayed, over and over, half an hour at a time. We wandered around the airport, which was nicely decorated for Christmas, sat and waited, wandered some more. Sunset in Orlando was pretty, but I hadn’t expected to be there for it. Finally the plane made it, or they assigned a new one, or something, and we got to board, about 4 hours late. The good news was that it was a bigger and nicer plane – a 767 – and had fully flat seats and a ton of leg room. The bad news was that because we were so behind schedule, the captain was trying to make up for it. It was a somewhat bumpy ride, and there was no time for food service (and we hadn’t eaten at the airport because we were expecting to eat on the plane). Oh, and this great plane didn’t have on board wi-fi, either. <sigh> Oh, well, I probably needed a brief period of disconnection. I read my book and hoped that all the bad luck was behind us. I should have known better. We got to Miami without incident, and went to collect our bags. One, two … oops, where’s number three? That would be my bag, of course. The largest one. The one that has, well, pretty much everything in it: most of my clothes, my extra shoes, all of the “incidentals” like hair stuff, first aid kit, door decorations, etc. The rolling garment bag with Tom’s tux and my formal dresses did make it and I did have extra underwear and one change of clothes in my carry-on. We spent a couple of hours at the airport, with baggage service trying to track it down. They decided it was still in Orlando, and said it would be put on the next flight and they would call me at the hotel when it arrived. Exhausted, we went to the hotel. I’ll be kind and say the hotel, La Quinta Inn & Suite Miami Airport East, was … okay. The room was really big. Not real nice, but big. There was a big crowd of people in the lobby, who were also going on cruises the next day. It was a bit … chaotic. There was no restaurant close by, but there were a lot of little flyers advertising delivery. The first one we called said it would take an hour and a half. We finally got some food, and it was actually pretty good. No call from the airline so I called them (they had given me a special number). I spent a long time on hold while they “checked.” Finally said it was still in Orlando but they would put it on the last flight of the day. Yeah, right. I could get it in the morning. I was tired of dealing with it that night. In the morning it will all be better … right? I actually got a few hours of sleep. Didn’t expect to, as I usually don’t sleep the first night in a new place – hotel, ship, friend’s house, whatever – but I guess my brain just wanted to escape. Next morning I got up early so I could go back to the airport, meet Kniki’s flight and, I hoped, get my bag. No such luck. We tried to partake of the free breakfast downstairs, but it was overrun with fellow cruisers and they weren’t a very polite bunch. Most of the food was already gone. I took a taxi to the airport, found Kniki without much trouble (so that was good), then went to stand in a long, long customer service line full of other people who were left bagless. Finally got to the desk, the lady was nice and very apologetic but no one could figure out what had happened to my elusive suitcase. Her record showed that it had come in on the morning flight from Orlando, but it wasn’t … anywhere. We wandered through the baggage claim area, checking all the conveyers and the odd corners where homeless bags gathered, but had no luck. Finally, they had me fill out a form, with my cruise info and itinerary, and told me that if (I noted they didn’t say “when”) they found it, they would deliver it to the ship. Wherever the ship might be. At this point, I was resigning myself to the prospect of wearing a formal dress and the Nikes I had on when I went on the helicopter excursion a few days later. Kniki reminded me that she and I wear close to the same size so I could borrow some clothes and/or shoes from her. 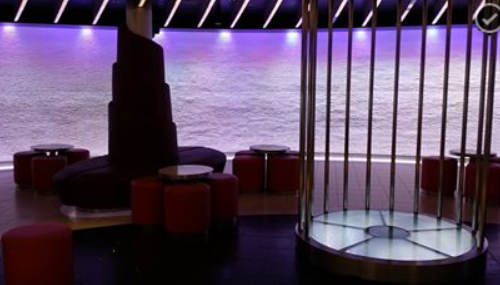 I hated to admit defeat, but I wasn’t accomplishing anything by hanging out at the airport any longer, so we went back to the hotel to get Tom and shortly after, got a taxi (no mean feat, with the wall-to-wall crowd in the lobby) to the cruise terminal. My run of lousy luck continued there, as we were misdirected into the wrong line, finally got in the right (priority) line, then when I went through security I left my little cross body bag (that had my passport, credit cards and phone in it) at the security station while collecting my other carry-on bags (I’m used to putting it inside my other bag when I go through airport security). I didn’t realize this until we were upstairs and at the check-in desk. Major panic time again. But the nice lady at the desk left, was gone for what felt like an hour and a half but was probably only ten minutes, and came back with a security officer who had my little bag (he explained that he couldn’t release it to her, only to me). Saved again. Someone Up There did seem to be watching over me on this trip – but only intermittently. I think my Guardian Angel has ADD. At any rate, we got checked in, were at the head of the line to get on the ship, and I headed for the guest services desk. The lady at the airport had told me to give them a copy of my lost baggage papers when I got on, so that they would know to accept it if (not when) the airline delivered it. I explained the situation and the Carnival guest services lady was just wonderful. She got on the phone with the airline to check on the status, and she gave me vouchers for free laundry service and a 25% discount on clothing or toiletry items in the ship’s shops. I was starting to feel a little better and determined to have a good time with or without my luggage. We finally got to our cabin, and it was just lovely. 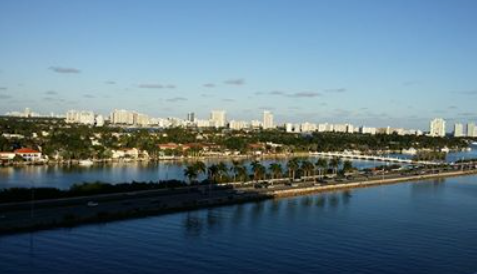 We had opted for an extended aft balcony this time, and we had a great view of the channel and that part of Miami. There was a nice breeze blowing and I started to finally unwind just a little. After a little while to sit and relax, we headed out to explore the ship. And what a lovely ship she was. I had been on the Magic, but Tom had never been on a Dream class ship before, and this was Kniki’s first cruise ship of any kind. 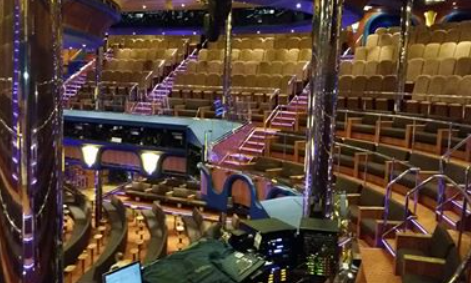 The decor is more subdued than on most Carnival ships, more Caribbean feeling. 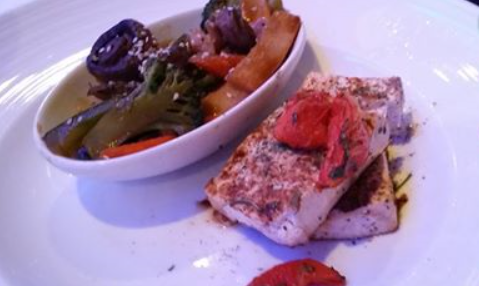 We were all hungry, so we head up to Cucina. This is the Italian restaurant that has adopted the philosophy that there is such a thing as a free lunch – or at least a lunch that’s included in the cruise fare. 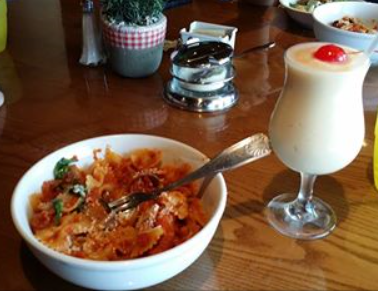 At lunch time, it’s a “build your own pasta” format, similar to Macaroni Grill (at night, they have a full menu and there’s a nominal per-person charge). After no breakfast that morning, and dealing with all the hassles thus far that day, the food tasted wonderful. And although I usually don’t drink alcohol until evening (if at all), I really needed that piña colada. Back to the cabin, and muster drill was coming up soon. The lady from the front desk called, asking if I had heard from AA and checking on whether I was “okay.” I have to give her straight A pluses for customer service (right up there with the credit card fraud guy). The alarm sounded and we made our way to the main dining room for the muster drill, which was mercifully brief. Sailaway was imminent, and we wanted to see it from our aft balcony, so we went back to the cabin again. A few minutes after we got there, lo and behold – there was a knock at the door and in came my prodigal Samsonite. I guess my Angel stopped being distracted. What a relief. Talk about cutting it close – fifteen minutes later, the ship was on the move. Oh, the tales that bag could tell about where it had been all this time, but it kept silent so I guess that will forever remain a mystery. All was well that ended well, and it was soon time to get ready for dinner. 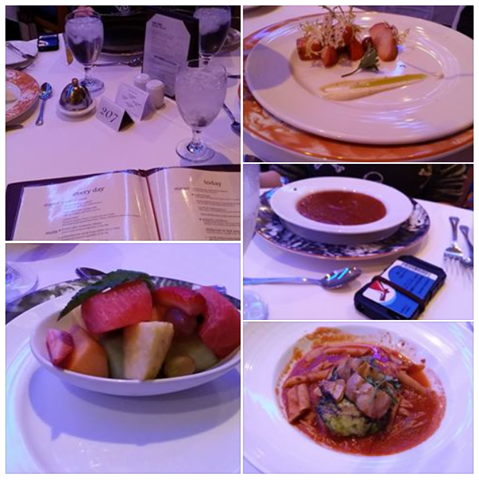 As always on a Carnival ship, it was delicious – even more so coming in the wake of all we had been through the last two days. 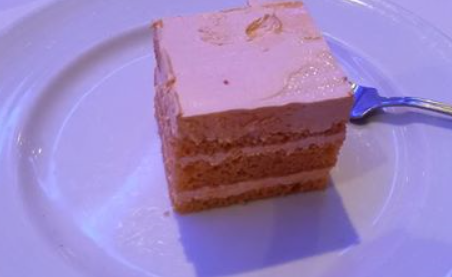 And as if to compensate for the roller coaster ride I’d just taken, they served my very favorite entree, Chicken a la Grecque, and one of my favorite sweets – the diet orange cake – for dessert. I was, at last, a happy camper. 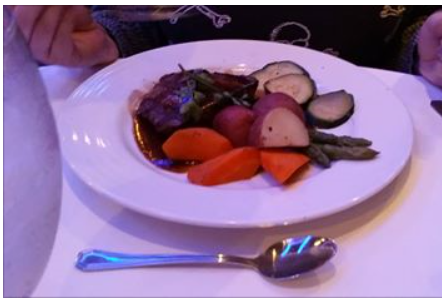 Another little treat was that when we got to the MDR, the hostess was a Russian girl that my cousin and I had befriended on my first Alaskan cruise the summer before. She recognized me, and it was great to see her again. 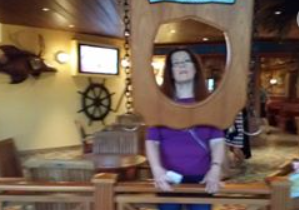 We walked around the ship a little more after eating, and caught the last part of one of the shows, but I was ready to go to bed early after getting only a few hours of sleep the previous two nights. When we got back to the cabin for the last time that night, I was happy to be greeted by my towel animal and FunTimes. I did get one thing done before hitting the sack, though – I got part of our door decorations up. Cabin 7466 was now officially our home for the next 8 days. I had staked my claim. That night I went to bed sure that this was going to be my best cruise yet, and I slept like a baby (and not a crying, colicky one, either).